Delegating responsibility to individual sites means less visibility and control of overall costs, while using different training suppliers at different sites can raise quality control issues. Even single site compliance can be a challenge in terms of the time required for supplier selection, training co-ordination and administration – often preventing learning and development managers from tackling other priorities. Yet compliance training is non-negotiable. Consistent standards across aspects like food safety, first aid, working at heights, IOSH health & safety and fire marshal (to name but a few) not only ensure legal conformity but are vital to smooth and safe production and operational confidence. 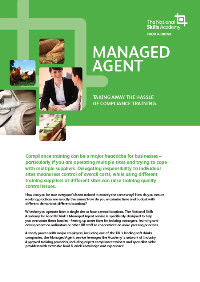 The Managed Agent service now available to the industry from the National Skills Academy for Food & Drink has been specifically designed to help businesses make better use of time and budget while ensuring all training meets best in class industry standards. Already proven with major employers, including one of the UK’s leading soft drinks companies, the Managed Agent service utilises the Academy’s established network of Industry Approved compliance training experts and specialist niche providers with extensive food industry experience. After initial support in determining precise training requirements and quantifying training demand, the Academy can either provide complete external management of the agreed training schedule or help with individual elements such as helping source industry standard providers at an agreed price. Importantly, the Academy can also take away all the day-to-day hassle of course arrangement - liaising with chosen providers, arranging dates and times, confirming on-site or off-site venues, arranging trainee invites and issuing and tracking resulting certifications. 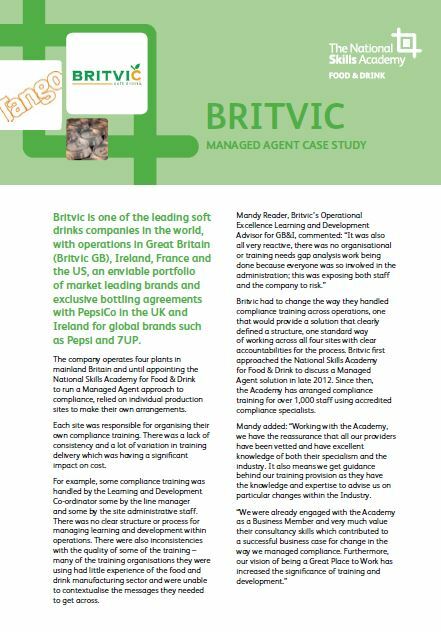 From strategic perspective, the control, consolidation and centralisation of the Managed Agent service has been designed to ensure consistent training and training outcome standards across multiple sites and enable multi-site firms to realise savings by leveraging their buying power among best in class providers. Detailed reports provide the complete picture of training implementation across the company including attendance levels, trainee satisfaction and training progress at site and company level – providing a full audit trail with minimum fuss and a single point of Academy contact. Course demand and course scheduling always stay within company control – meaning no budget surprises as everything is planned for, known and agreed at the onset.